OKPOL was established in 1991 in Pawłów near Brzeg in Poland. They started as a small company employing just a few workers and have grown steadily over the years. 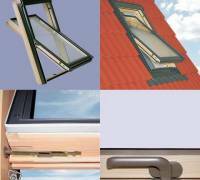 From the beginning they specialized in the production of wooden roof windows, accessories (roller blinds, Venetian blinds, awning blinds, insect screens, etc) and access roof lights. During this time they have always focused on their customers requirements. Their main aim is to supply the highest quality products, that is why they are constantly improving the windows and introducing unique designs that keep them at the forefront of the window market. OKPOL is the only Company in the UK offering roof windows with a fully AUTOMATIC AIR INLET. Thanks to the policy of investment in research, manufacturing and design they are one of the largest roof window producers in Poland. OKPOL roof windows are made of top-quality pinewood bonded in layers and protected with an impregnating agent and double-coated with a colourless finish lacquer. 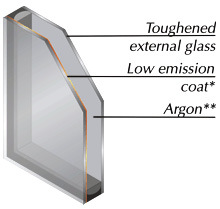 All OKPOL windows are double glazed with sealed units filled with Argon gas and with low emission glass on the inner skin achieving a themal insulating value of U = 1.1 W/m²K (which is equivalent to aprox, 3cm of extruded polystyrine)Special gasket placed under the glass on the bottom of the sash drain off possible condensation. Spacer between glasses is made of one element to reduce thermal brides. 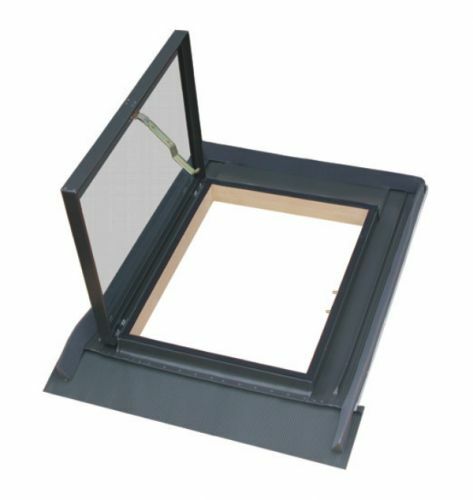 The air inlet is installed inside the frame and does not reduce the glazing area. This allows a flow 24 m3/hour of fresh air in to the room even when the windows are closed and also enables the room to remain heated. This can be manually reduced to 12m3/hour or zero. The air inlet and filter are easily removed and replaced for cleaning. 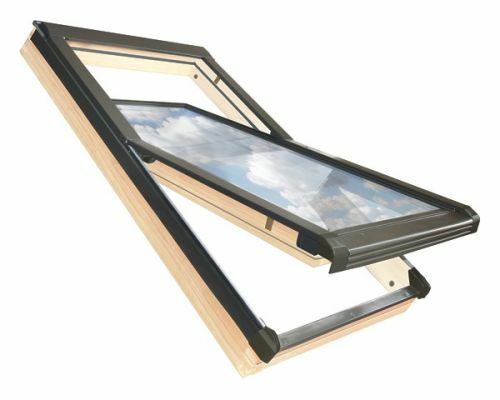 The hinge is placed in the middle of the frame and allows the sash to be tilted to any angle for ventilation or rotated by 180º for cleaning exterior glass. The bolt locks the window open at an angle of 20º, protecting it against unwanted opening e.g. by children or the wind. It also allows the window to be secure when rotated by 180º for easy cleaning of the exterior glass. The handle placed on the bottom of the sash allows the window to be locked in three positions: 1. Window is locked, 2 and 3 There is gap between frame and sash for ventilation. On the exterior, the wood is shielded with weather-resistant aluminium profiles coated with grey polyester. To get the best from your roof window in terms of easy maintenance and the best field of vision it is suggested that you follow these instructions. The smaller the incline angle, the longer the window should be. The recommended level of the bottom edge of the window is between 100 - 120 cm above the floor and top edge between 200 - 205 cm. See diagram. The flashings are an essential part of fitting the roof windows with different roofing materials. 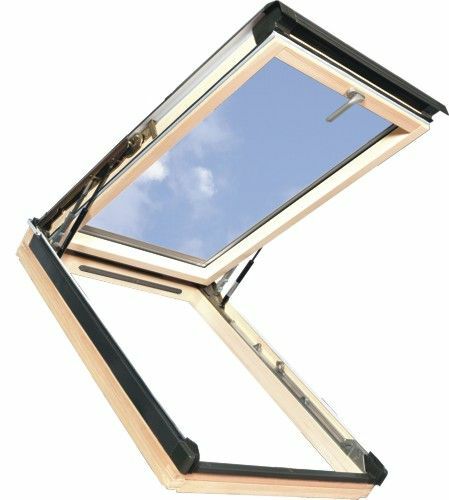 They are designed to make a secure connection between the windows and the roof against any weather conditions (rain, wind or snow). The correct flashing type will ensure a durable and neat fit with all roofing materials. Available in different versions. Glazing unit 4H x 16 x 4T. Glazing unit filled with Argon gas. Spacer made of one element (just one connection). The first class pinewood, bonded in layers. Impregnated wood with triple coating. Profile holding the glass with closed corners. Profile holding the glass in covering colour. Adjusting elements made of plastic. Automatic air inlet VENTAIR MAGNETIC SYSTEM. Al heat transfer for glass U = 1.1 W / m² K according to EN 673 (U = 1.0 W / m² K as per EN 674). External self-cleaning glass SGG BIOCLEAN. Glass filled in 100% noble gas (Argon). Spacer frame of a single element. Glued wood sauces Class I. Profile dociskający window closed at the corners. Profile dociskający glass color oblachowania. Equipped with a manual ventilator slot. Al heat transfer for glass U = 1,1 W / m² K as per EN 674. Glass filled with noble gas (Argon). Made of multi-lead-free PVC profiles in white, metal-reinforced section. Profile window closed at the corners. 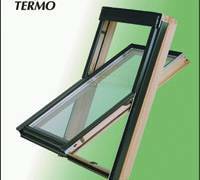 Tilt-sliding window PERFECT PLUS BH. 1. the repeal of about 30º to freely approach the window. 2. the repeal of about 60º possibility of safe evacuation. when you open the window, the whole wing is floating on the outside and the attic space is not. 3. safe reversal of the plane wing on the frame in order to wash the outside windows. 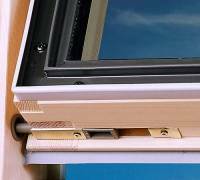 unique solution to prevent being hit in the head at the open window, which is possible in the case of windows and wysokoosiowych turnover, greater safety and comfort of the window. 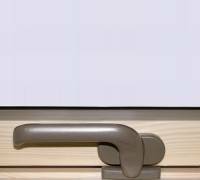 - Made of laminated pine, secure means impregnującym. - Safe installation without the need to draw the window sash from the frame. - Uniform circumferential seal and design, providing improved tightness Door leaf before the wind. - Tempered glass exterior, self-cleaning SGG BIOCLEAN. - Automatic ventilator VENTAIR MAGNETIC. - Possibility to install mosquito nets in the frame. - Designed to slope roofs with a slope of 15o-55 °. (expand description) (collapse description) Get out in the open right OKPOL Versa rack, made of pine wood (frame) and aluminum (wing). Equipped with hardened glass, also has a lock on the wing at the maximum opening. Color charcoal. Available on Left or right opening. The OKPOL COMFORT (OC) and VENT (OV) roof windows with VENTAIR MAGNETIC 3 SYSTEM can achieve the replacement of 24 m3 /hr air per person from the room. The intake ventilation ensures balanced in-flow of fresh air, whilst the amount of exchanged air is not changed even by a strong wind. It is possible to decrease the volume of air flow to 12 m3 /hr. It is also possible to shut the air inlet. The system will react to changing weather conditions, such as adjusting the air flow when there is a change in air pressure. 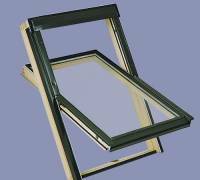 The air inlet is installed inside the frame and does not reduce the glazing area. This allows a flow of fresh air in to the room even when the windows are closed and also enables the room to remain heated. The filter is made of a durable fabric and cleans the air. It can be taken out to allow the removal of any dust from the inlet channel. To help with easy cleaning the filter is simple to take apart and re-assemble. The air inlet works silently. The air inlet thanks to its outstanding properties can in part discharge humid air when normal gravitational ventilation isn't working properly. 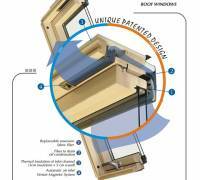 The air inlet design also protects against condensation forming on wooden parts of the window. Self-cleaning glass SGG BIOCLEAN been developed to improve the comfort of using windows. Thanks to a special, transparent shell, permanently associated with the surface of glass, organic dirt, dust and other sediments are removed automatically under the action of sunlight and rain.